Dr Hagen earned his medical degree from the University of Wisconsin School of Medicine and Public Health (formerly UW Medical School), Madison, WI and completed his pediatric residency at David Grant USAF Medical Center in California. After serving in the U.S. Air Force as a general pediatrician for nine years he completed a fellowship in Pediatric Critical Care at Duke University. Dr. Hagen returned to Madison after serving as an attending physician for eight years, three of them as an attending physician in the Pediatric Cardiac Intensive Care Unit at Children's Hospital of Wisconsin in Milwaukee. His clinical interests include the peri-operative care of congenital heart disease, the delivery of health care in developing countries, and improving teamwork and the multidisciplinary delivery of health care in the pediatric intensive care unit. 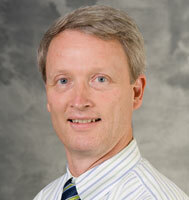 Dr. Hagen is board certified in both general pediatrics and pediatric critical care. Dr. Hagen also has an interest in improving the delivery of health care in developing countries. He is involved in the education of health care providers and allocation of appropriate resources to improve health care for children in countries that are limited in their resources and educational opportunities. Dr. Hagen is currently involved in children’s hospitals in Uganda and Ethiopia.